An influx of drivers throughout Avon, Indianapolis, and Plainfield have inquired about the differences between regular vs. synthetic oil, so our team at Andy Mohr Toyota created this helpful guide. As you read through this copy, you’ll get a better feel for the overall purpose of motor oil and the various differences between regular and synthetic options. If you still have questions or want to schedule an oil change, you can always reach out to our Toyota dealer! What Purpose Does Motor Oil Serve? Before learning about the differences between regular oil and synthetic oil, it’s important to note the overall purpose of motor oil. As your engine works to get you from one place to another, your motor oil works to ensure the engine is running smoothly and avoiding issues, such as overheating or wear and tear. If you log a large number of miles each week or each month, this puts a strain on the various working parts underneath your hood. Thankfully, the motor oil also serves as a lubricant to help these parts avoid grinding together. Another useful trait of motor oil is its ability to trap or collect dust and debris that could otherwise become clogged in your engine. As the motor oil circulates through various compartments, it picks up this dirt before eventually dropping it off in the air filter. Now that the purpose of motor oil is better understood, let’s dive into the real debate between regular and synthetic options. One of the key differences between these two possibilities is how they’re created. Regular, or conventional, oil is refined from crude oil, which is a fossil fuel. On the other side, synthetic oil is artificially manufactured in laboratories. This process involves pairing molecules together one by one in the hopes of creating a more reliable and effective motor oil. This artificial process does end up yielding some positive results, too. Synthetic oil is usually more durable, in large part because of its ability to withstand extreme exterior and interior conditions, such as drastic heat or bitter cold. It also lasts longer over time, meaning you won’t have to change your oil as often as you would with regular oil. It’s better for cold weather conditions. It’s better for hot weather as well. It’s more reliable and offers less deposits into the environment. The oil pairs better with turbo-charged engines. Who Wins the Head-to-Head: Regular or Synthetic? 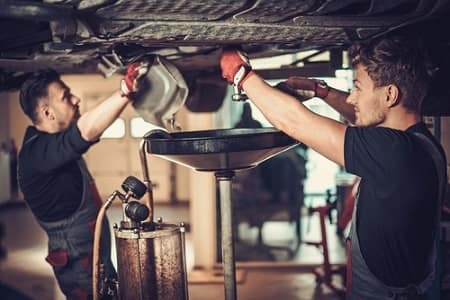 Given the various advantages of synthetic oil, it’s often recommended over regular oil, which is especially true with drivers who have large vehicles. The engines in trucks or large SUVs work hard to generate the necessary amounts of power. This exertion would quickly wear down the regular oil, whereas the synthetic oil would do a better job of thriving in these tough conditions. So, if you’re looking for a way to get the most out of your engine, synthetic oil is likely the way to go. Also, our dealership offers synthetic oil change coupons to help ensure you’re getting the best deal each time you visit our service center! Stop in for a Synthetic Oil Change! 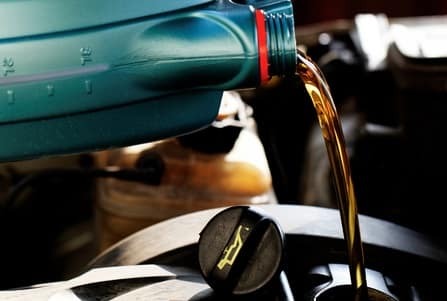 If you’re eager to get your Toyota model running on superior synthetic oil, then contact the service center at Andy Mohr Toyota. We offer quality service to help your vehicle run at peak performance, so you can keep cruising around Avon, Indianapolis, and Plainfield.